Women face many biases and challenges as they try to find success in the sales industry. Read our report to see how over 500 men and women in sales view gender bias, what factors may contribute to the pay gap, and what factors could increase satisfaction for women in sales. 1 in 4 men in the sales industry said women in sales didn't experience any bias. Women reported earning 23% less in commission and salary than men. Women who reported frequently working overtime earned 21% less than men working the same amount. Less than 25% of men and women in sales felt that management was fair. 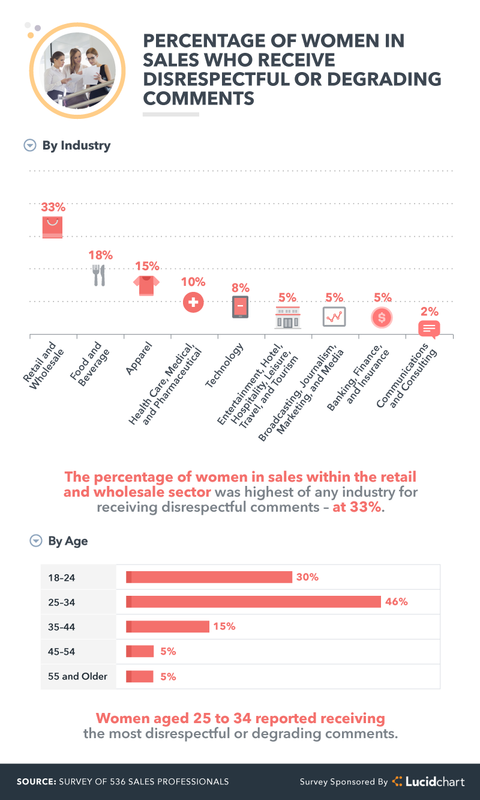 33% of women in retail and wholesale positions receive disrespectful comments while at work. 62% of women reported that a more flexible schedule was their biggest motivation to succeed. It takes a lot to be successful in sales. Hitting your stride takes time and dedication to the craft. Experts will warn you that you can’t get to the top without a willingness to go the extra mile, a strong ability to listen, and confidence that won’t let the sting of rejection hold you back. But what it takes to be a successful woman in sales might be even more demanding. Today, the sales industry has the second-largest gender equity gap in America. And even though companies with more gender diversity typically outperform those with less, fewer than 1 in 5 women in sales hold leadership titles. 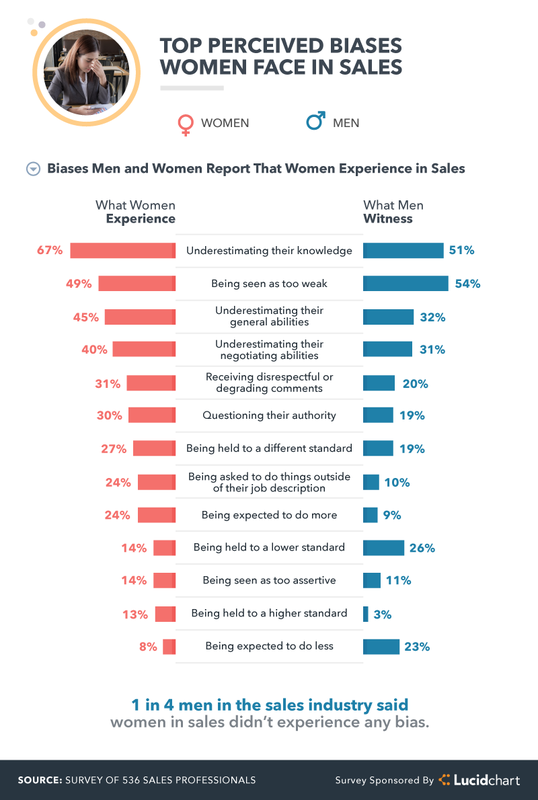 To shed some light on the hurdles that women in sales face, we surveyed over 500 men and women in the sales industry throughout the United States to get a firsthand look at just how drastic the gender gap is. Read on to see how men and women in sales see gender bias, what factors may contribute to the pay gap, and how men and women define job satisfaction differently. A key contributor to the gender equity gap may be closely tied to the biases that women experience in sales roles. Overall, both men and women agreed on the two most prevalent biases women face in their industry: underestimating their knowledge and being seen as too weak. While many biases on the list were recognized at roughly the same level by both men and women, the data hints that men still suffer from a few blind spots. We found that 1 in 4 men working in sales said women in their industry don’t experience any bias whatsoever. There were additional discrepancies between men and women's perceptions of bias around performance expectations: 23 percent of men reported that women were expected to do less compared to 8 percent of women who shared that perception, with almost the opposite split appearing on the question of women being expected to do more (women reporting this bias at 24 percent vs. men at 9 percent). "I've been told on multiple occasions that I'm being put on a project with a client because they 'like pretty girls.'" These biases about women’s ability to perform in the sales industry may play a role in the pay and growth gaps we found between men and women in sales. 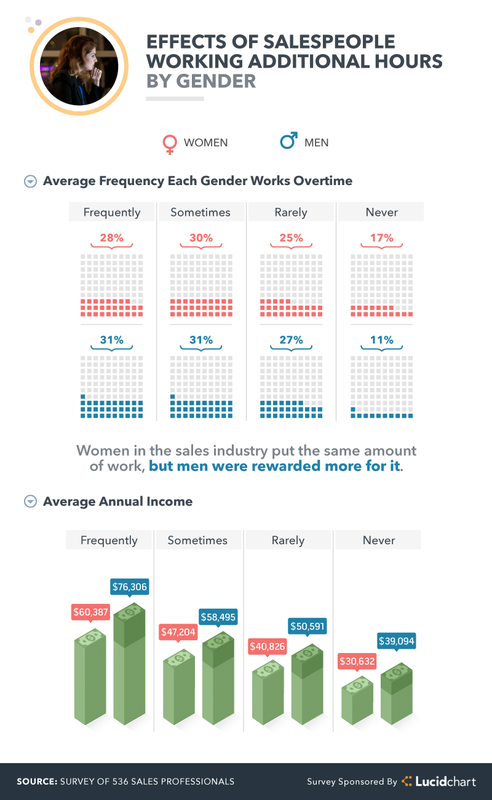 Let’s examine the data on women’s compensation and growth opportunities in sales. Most studies agree that women in the U.S. earn roughly 80 cents for every dollar a man earns. While the gender pay gap varies by both region and industry, men and women we surveyed in the sales industry revealed the differences in their own salaries. The study showed that this gap holds true in sales: Overall, women reported earning 23 percent less in commission and salary than men reported ($60,987 for women vs. $75,000 for men). The gap is even wider for sales professionals working at only a salary or hourly rate. The pay gap appears to close when salespeople are compensated on commission, narrowing to a 10 percent difference (women earning $36k vs. men earning $40k). 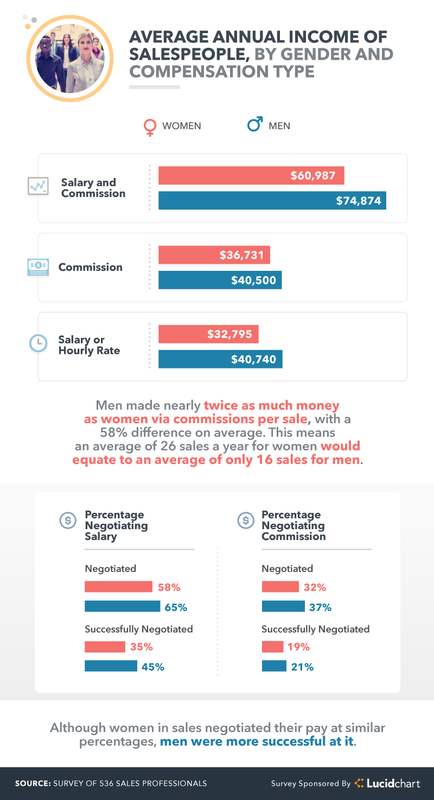 However, the survey revealed that men made almost twice as much on commission per sale ($2,531 compared to $1,389). Although this discrepancy could be due to a variety of differences, such as industry standards or the types of goods and services sold, overall, women needed to make roughly twice the number of sales in order to earn the same amount as the men. "My female boss was promoted when the male boss above her left, and they paid her 20 percent less than they paid him." It could be easy for people to assume that there's a large compensation gap because women are less likely to negotiate salary and commission. However, the data reveals that women are only slightly (5 to 7 percent) less likely to negotiate—and only slightly (2 to 10 percent) less likely to be successful. While negotiation still plays a role, it may not explain the full 24 percent pay gap. If negotiation doesn’t completely solve the pay gap puzzle, could the pay gap be explained by men working more hours than women? The data suggests that this isn’t the case: Women are nearly as likely to work overtime as their male colleagues, but the more overtime women put in, the wider the pay gap gets. Men who reported frequently working overtime earned an annual rate of over $76,306 on average, while women putting in the same amount of extra time earned 21 percent less at $60,387. For women, clocking extra hours isn’t always enough to put them at an equal compensation rate with their male peers. Though overtime and lack of negotiation don’t seem to majorly affect the gender pay gap, the survey did bring one contributor to light: the lack of growth opportunities. According to a Women in the Workplace study released by Sheryl Sandberg’s LeanIn foundation and McKinsey & Company, one in 10 senior leaders is a woman, and 50 percent of men think that’s good enough. Sales organizations reflect that trend: With few exceptions, industries across the board have far more men in management positions than women. In communications jobs, for instance, men were four times as likely to hold management roles than female employees. In technology, long fraught with claims of both racial and gender bias, men were more than twice as likely to hold management roles over women. 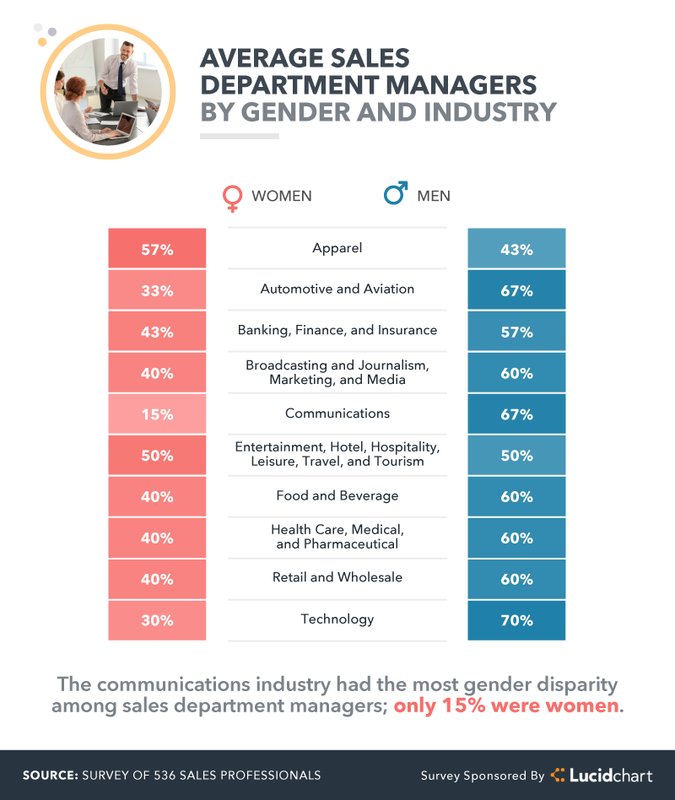 Of the 10 industries we examined, apparel was the only one with more female managers than male managers (four compared to three). "Only men move into management positions in my company." While the data confirms that a gender pay gap exists in the sales industry, it also reveals that it will take more than paying fair, balanced wages and providing more growth opportunities to increase job satisfaction for women in sales. Sales leadership needs to consider what factors could impact job satisfaction within their individual industries. Women’s satisfaction ratings were lower than their male colleagues in every industry except two—entertainment/hospitality (80 percent) and communications (53 percent). These two industries were rated lowest by their male colleagues. In the industries that men rated highest, women expressed significantly lower job satisfaction. For example, 80 percent of men felt satisfied in jobs related to broadcasting and journalism compared to only 62 percent of women. In the apparel industry, rated second highest, 63 percent of men felt satisfied in their jobs compared to only 41 percent of women. "I've been told male direct reports make more than me because they have a wife and kids to support." As sales leaders are looking for new levers to pull to improve job satisfaction, improving employees’ perceptions of the management team may go a long way to boost those numbers. Across the board, less than a quarter of men and women in sales felt that management was fair. Opening a dialogue between management and direct reports could be a great first step toward improving those relationships. What other factors might affect job satisfaction in the workplace? Along with unfair management and industry-specific challenges, women in sales sometimes face disrespectful or degrading comments at work. Again, industry seems to predict how many disrespectful comments women in sales may face. Retail and wholesale positions appear to be the most challenging for women, with 33 percent receiving out-of-line comments while at work. "I've been told I must be PMSing because I was angry at a co-worker for stealing one of my clients." Age also plays a role. Younger women tend to face degrading or disrespectful comments more often than older women: Almost half of the women aged 25 to 34 and one-third of the women aged 18 to 24 said they experienced disrespectful or degrading comments at some point. While disrespectful and degrading comments are not exclusive to women, it’s clear that there are opportunities for improvement, especially when it comes to protecting or nurturing younger women and addressing the problems by industry. Work environments with professional and courteous communication could help to increase job satisfaction for women in sales. "My boss told me that he makes his wife stay at home and that I should stay at home as well since my husband could take care of me." 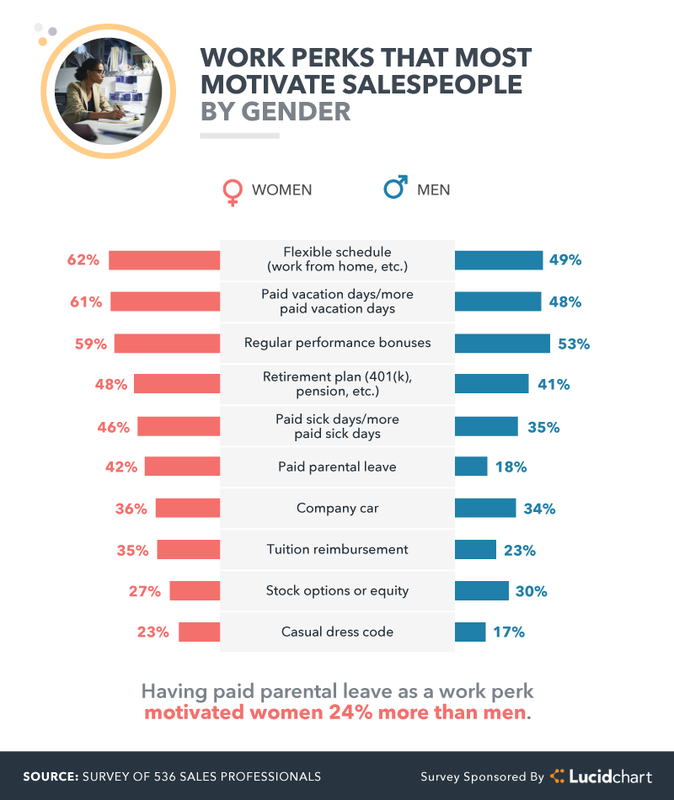 Another factor to consider when it comes to creating a positive workplace experience for women in sales is providing more tailored incentives for high performance. While more than half of men rated regular performance bonuses as a company perk that motivated them to do their best work, women had different ideas about what inspires their success. 62 percent of women said a more flexible schedule, including the ability to work from home, was their biggest motivation to succeed (compared to 49 percent of men), and 61 percent of women said more paid time off or vacation days inspired them to perform (compared to 48 percent of men). Regular performance bonuses motivated 59 percent of women, and 48 percent reported a retirement plan like a 401(k) was the perk that motivated them the most. "My colleague was fired for taking maternity leave." For women, the benefits of a strong work-life balance may mean more than traditional forms of compensation. For those attempting to juggle their sales careers in addition to home lives and parenting duties, having more time off or flexible hours can have a higher value than monetary bonuses. Working in sales is already hard enough. For people working on commission, your entire livelihood is based on your ability to perform. And to be successful in the sales industry, you likely have to put in extra work during off hours to get (and stay) ahead. In this study, we found that women face significant challenges beyond the pressure to work overtime and hit quota. Even when they put in the extra time or go the extra mile, men still out-earned women in every category. Women also reported significant biases they’d experienced personally and the sexist behavior they’d seen taking place against their co-workers. As hard as getting ahead in the sales industry might be, it remains even more difficult for women. With an awareness of these biases, companies can forge ahead, correcting the discrepancies and creating an environment where salespeople of all genders can feel valued and receive the support they need to achieve both their personal and professional goals. We collected responses from 536 sales professionals through Amazon’s Mechanical Turk. Respondents had to be currently working in a sales position to qualify. 56 percent of participants were women, and 44 percent were men. Participants ranged in age from 18 to 68, with a mean of 33 and a standard deviation of 10. The presented data rely solely on self-reporting. Self-reported data are typically paired with several issues. Some of these issues include but are not limited to telescoping, exaggeration, attribution, and selective memory. No statistical testing was performed for this study, so the claims presented above are based on means alone. This report is purely exploratory, and future research attempts should approach this topic more rigorously. Find our data thought-provoking? Contributing information about the challenges faced by women is important, and we support sharing these data and graphics with your audiences for noncommercial purposes. When you do, we just ask to please link back to this page to attribute us appropriately. Close bigger deals faster in Lucidchart.